You will be redirected to the new site. Fun! I love PVC! It's got so many fun uses! And cheap!...my favorite! Don't even try this if you have low water pressure, it wont work. It will if you drill smaller/fewer holes. So much fun - we'll make one this summer! Ooops--I just followed the link and saw it on Pinterest, too--so amazing! That car wash is really cool. Does anyone know who the original picture belongs too? This is such a great idea and I love that it's durable and inexpensive. Thanks so much for sharing! Where did you find the adapter? I spent 25 minutes at Lowes with no luck! How awesome is that! I love it and know my kids would too! Can you link it up to "its playtime"? I want to feature it this week!! I am going to try this for my school's Field Day. What a great idea! I can't wait to make this for my grand-critters AND my garden! Just a minor correction...if you break it you can joint it back together with a "coupler". Might help at the hardware story instead of having to seal off the end of the T Joint. :) awesome idea! This could be built big enough to go around a small garden, just leave it set up and hook up the hose when you need to water. Love it! I might just have myself a garden this year! That's what I'm thinking. There's no reason why it has to be made in those exact dimensions. We made on yesterday and the kids LOVE it! We were the envy of our block! lol My husband made a VERY large octagon because we had a TON of PVC up in the rafters just sitting there. Thanks for the AWESOME idea! im with you we just made one and the water doesnt come up at all :( all that work and the kdis are bummed :( oh well we tried at least ! I had a friend that made this today and at first it failed because she had to many holes. She went back and covered some of the holes with duck tape and it worked perfectly. Only 12 holes per 4 foot piece made a huge difference:) hope this helps! Water pressure is usually the culprit. Ours worked better in our front yard than our back because we have more pressure there. This is genius :-) :-) :-) !!!!! Can't wait to try it at my preschool!!!! Thanks for the super idea! So cool! I'd love for you to share at my Outside Play Party. Where did you find the hose to pipe connector? I can't find one anywhere? How did you get the plastic connectors to attach to the metal hose? And you may have made the holes too big. Your pics show no holes drilled in the pvc with the t that the hose connects too. Is this correct don't drill holes in this side? Thanks! http://project414.com/2012/07/16/vacation/#more-840 We had the best time playing with our new sprinkler! This is an awesome idea with so many other uses. I think you should know that your project has been totally ripped-off by Instructables, who do give a link back to this article, but then go ahead and re-do your project exactly the same way!!!! That's so awesome! The cute little gal seemed to have a lot of fun playing with it. That's one thing my kids will surely love. I gotta try this at home! I would think you'd want to put the t-cupler very close to the 90 degree corner for ease of draining the sprinkler system. making my shopping list now! Has anyone tried this without using the cement? I'd like to be able to take it apart at the end of the season (or at least partially disassemble, for storage as straight edges). Perhaps only the hose connection needs cement? Other things i've made with PVC, those connections are really tight on their own, but i haven't needed to run water through those structures. Also, I'm cheap - could make my desired size for $8 without cement, $15 with cement :) for the raised garden. We have something similar watering a grow bed in our aquaponics system. We didn't use any glue because we need to be able to take it apart for occasional maintenance. Also, for a garden, I'd recommend thinking about pointing the holes down so that the water doesn't spray up so much. Then you don't lose as much to evaporation. This is an awesome idea! I made one in about 2 hours with drying time for the cement. However, I didn't get the spray I hoped for when I turned our water on. I think it's because we live on well water and we might not have enough pressure. But I'm hoping to give it to one of my friends in the city and hopefully it will work better for them. My sister made one of these and her children loved it. It was simple and cheap. It also worked well to water her garden when the kids weren't using it. Great idea. That looks like an awesome project! My kids would love to have a little sprinkler like this to play in. 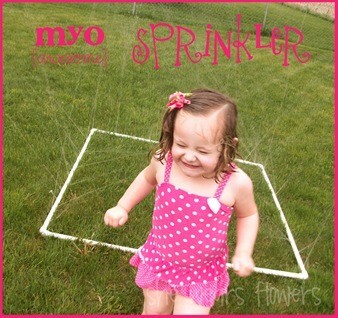 It would work out pretty well for the smaller kids that don't want to run in the actual sprinklers. Wouldn't it be better to drill your holes after you put it together? Good way to water the flowers or garden! That was really awesome. Nice project of watering plants using PVC Pipes. You don't say what size of a drill bit you used to drill the holes. Could make a difference if you have low water pressure. In the materials list, she says use a 1/16" bit. Brilliant idea! I'd make one for the kids at home. Very resourceful indeed. Gotta look for pvc pipes and start working on this one. this would work great in a garden too. Just use 3 elbows and use the T in place of the fourth to make drainage even easier. I found an adaptor at Ace, but not the exact one in the tutorial. It was the most expensive part of the project and still only a couple bucks. The whole project cost less than $10. Very cute project, my niece and nephews will love it. Vahini Irrigation Pvt Ltd is leading company of PVC pipes manufacturers in Bangalore, India. We also providing you service of Drip Irrigation System, SWR pipes and Electrical conduit pipes. Really very nice information. Thanks for sharing such a useful and informative post. I like to share my projects on my blog and they aren't even all girl projects! Make this a little bigger, put it under the trampoline and you`ll have fantastic thing to cool you down on hot days. I am having trouble finding the tutorial on making this please help. Web site wont load..